Now that September is officially here, our schedules tend to pick up. Fall is my favorite time of year but it can also be quite hectic. With quick snacks like these Snickers Rice Krispie Treats, you might find a few extra minutes to yourself. It’s not uncommon in our household to make a half batch of Rice Krispie Treats a couple times a week. It’s the one thing I don’t mind making because it usually takes less than 10 minutes to make. Just yesterday my boyfriend asked for a batch. I turned to him and said, seriously? With all the desserts in this house (a total of six), and he wants plain Rice Krispie Treats. Yep, that’s pretty typical. I make these Snickers Rice Krispie Treats when I am looking for something a little extra special. They are full of chocolate, a bit of caramel and a hint of peanut butter. I am thinking I need to make a peanut butter version of my Rice Krispie Treat S’mores! What do you think? 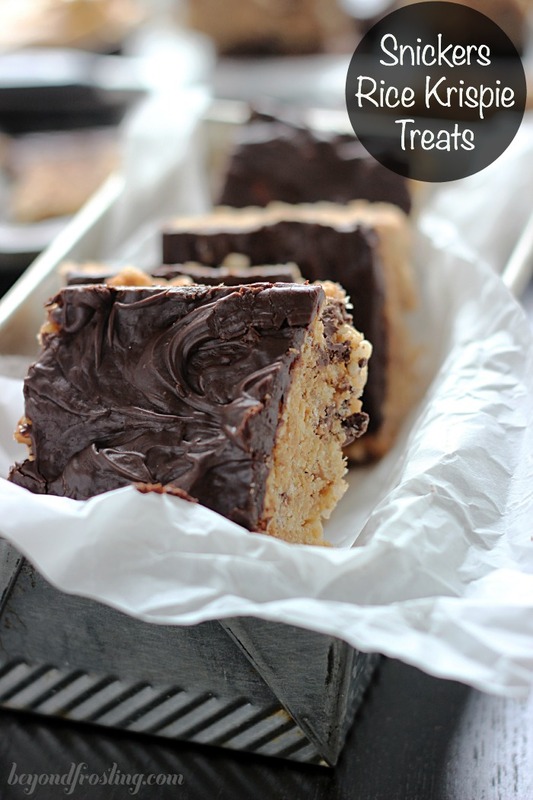 A peanut butter Rice Krispie treat packed with chocolate and Snickers bars. 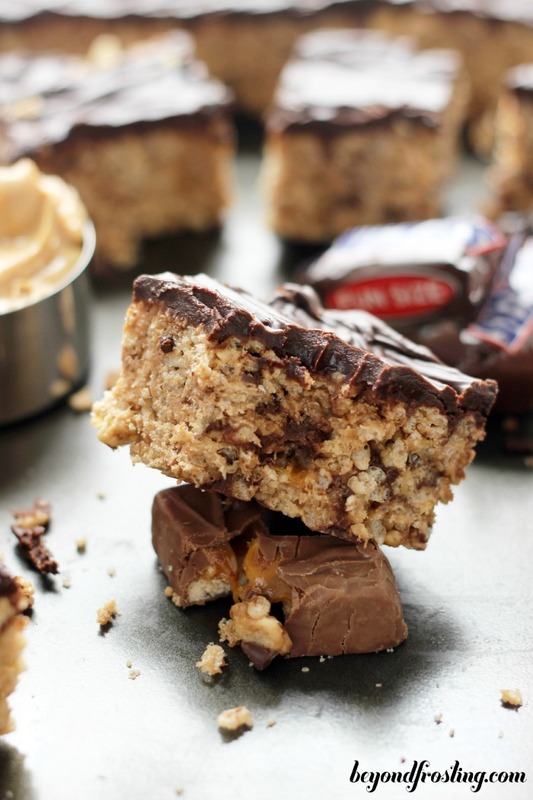 Unwrap Snickers bars and chop into small pieces, set aside. Grease a 9” by 9” pan with Crisco or cooking spray. Melt butter in sauce pan and stir until it starts to brown. You will smell a nutty aroma. Add marshmallows and peanut butter. Stir until marshmallows are melted and mixture is creamy. In a large mixing bowl, combine Rice Krispie cereal with melted marshmallow mixture. Mix with a spatula, and add chopped snickers and mini chocolate chips. Pour mixture into greased pan and compress with the back of your spatula until firm. To make the chocolate ganache, combine chocolate chips and heavy cream. Microwave for 60 seconds. Stir until melted. Pour melted chocolate over Rice Krispie Treats and spread evenly. Set aside until firm. I love RKTreats sooo much too! I need this amazing recipe in my life! Snickes and rice krispies and chocolate? Im so excited!